It's easy to believe communicating with one another is as natural as talking. You have discussions with your boss, conversations with colleagues and brainstorming sessions at team meetings; yet misunderstanding abounds. Our Purpose at What Is Dialogue is surprisingly simple:to help your management teams communicate on levels that produce deeper creative and innovative results. Dialogue opens ways to engage your employees; deepen customer relationships; build trust in group settings; address conflict; and communicate better on all levels of your business. Dialogue is not about talking. Dialogue is about listening – actively listening -- in a way to fully understand -- building a deeper sense of community, greater trust and a shared comprehension of your company’s vision. As a communication technique that works at every scale, Dialogue can help to manage meetings, increase your team’s productivity, generate new knowledge or discover the next new product or process for your firm. Creativity is enriched in Dialogue, making it an excellent tool for innovation and strategy setting. In today’s business environment, driving forces have converged, intensifying the need for Dialogue. The growth of technology and muddled boundaries are shifting relationships at all levels of business at a time when organizations are facing profound change and rising complexity at a speed and intensity never experienced before. From large institutions to smaller businesses – from start-ups to solo entrepreneurs, the practice of Dialogue creates benefits that impact the bottom line. People are developed. Costs are reduced. And because people hold a shared purpose, work activities become more efficient, more effective and cultivate the capacity for high performance. 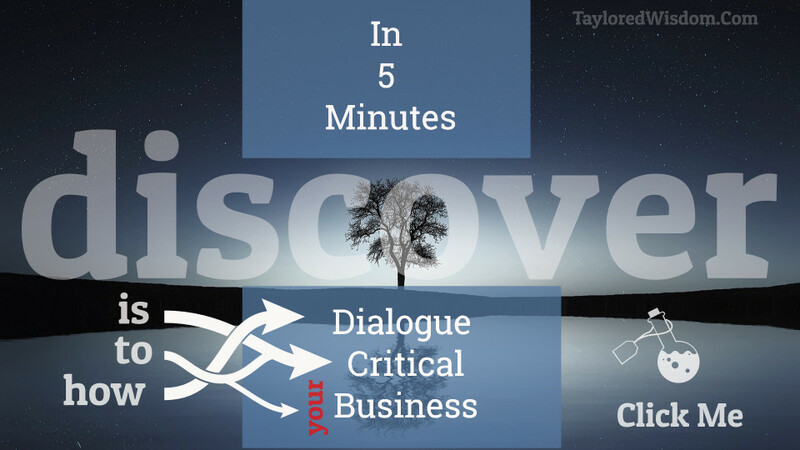 Asking yourself "What is Dialogue?" is the first step towards growing, innovating and expanding your business..
all would go well. But we don't appear to have it. So we have to find a way that works."